wow. what a tragic story, but at the same time, uplifting and inspiring. what a combination of fates: a super gifted athlete, and a tragic accident, and what might have been, if he had been given the chance. my mind is still back there doing a, what was it, double back somersault with a twist off the montlake bridge. I would like to have seen that. thanks for the article. I’m a cousin of Brian. Our family was always riveted to the TV, watching him perform. He was a real hero to me. I was 10 when he had his accident. Our family was really in shock, especially since he seemed so indestructible. His story is incredible but what occurred from that accident was his amazing faith that lasted through his lifetime. He never gave up trying to find medical solutions for his condition, but his faith in God and love for his family never wavered. He spoke at events, was an inspirational subject in many books, and inspired many people around the world….certainly more people than if he remained simply an athlete. 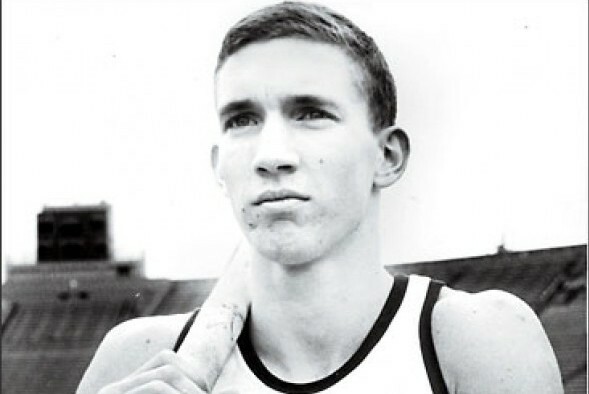 Brian was a man of principal and a man whose love for God surpassed his athletic abilities. One of the reasons I am a Christian is Brian’s example of faith regardless of his situation. He is indeed in heaven, vaulting over stars and the memory of his life will continue to inspire many people to become champions in their own lives as well! And Helen has been an example of real love, a hero to have committed her life to caring selflessly for him throughout his lifetime! I knew Brian through gymnastics. Was 12 years old and with Brian at the exhibition the night before this trampoline accident. Will never forget the call telling us about his injury the night of the accident and not wanting to get the paper the next morning, knowing what the headlines would be. What a wonderful person! At the exhibition I remembered thinking how lucky I was to know this great athlete and person. Just before I left to compete in the 1968 Olympics he gave me a small book with “words of wisdom, prayers, etc.” for the Christian Athlete. Still have it. Last saw him in 2002 or 2003 at a memorial for a fellow gymnast. We had a nice visit. His positive outlook, in spite of everything, is what I will remember most. Finally, his suffering is over. Thank you for that, Joyce.